The DMK Wednesday finalised the seat-sharing exercise with key ally Congress for the coming Lok Sabha elections, allotting it nine seats in Tamil Nadu and one in neighbouring Puducherry, a day after arch rival AIADMK cobbled up an alliance with the BJP and PMK. Announcing the pact at the party headquarters 'Anna Arivalayam' here, DMK president M K Stalin said the constituencies to be contested by the Congress will be announced later on the conclusion of seat sharing exercise with other allies. 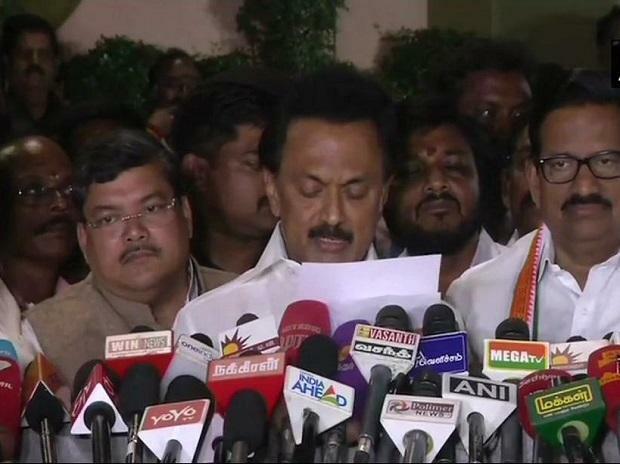 DMK had already appointed committees to steer the alliance process, Stalin said flanked by All India Congress Committee general secretaries Mukul Wasnik, in charge of Tamil Nadu and Puducherry, KC Venugopal, state unit party chief K S Alagiri. The work on seat sharing with other allies will begin from tomorrow, he told reporters. There are a total of 39 Lok Sabha constituencies in Tamil Nadu and one in the union territory of Puducherry, ruled by the Congress. In the 2014 elections, the Congress went alone but failed to win none so as the DMK which had led an alliance with some smaller parties. The AIADMK won 37 seats while the BJP and PMK one each in Tamil Nadu with the lone Puducherry seat going to AINRC. Describing the alliance between Congress and DMK as a long term relationship since the days of late Dravidian patriarch M Karunanidhi, Venugopal said "we are very happy," about the seat sharing agreement. "The country very much needs this alliance, the entire country is disappointed with the Narendra Modi government," he said. Asked about the other parties with which the alliance will be firmed up, Stalin said DMK has "decided to hold talks with "friendly outfits" which have been working together with it "on people's issues" for the past about two years. He was obviously referring to parties, including Vaiko-led MDMK, CPI and CPI(M). Also, the IUML, a long-time ally of the DMK, and VCK, which fought the 2014 Lok Sabha polls with it, are all set to be part of the alliance being put in place by the Dravidian outfit. Asked if DMDK led by actor-turned-politician Vijaykant would be a part of the alliance, he said if that happened it will be informed to the media. DMDK is in talks with the AIADMK for an alliance but a deal has been delayed with reports suggesting some differences over the number seats to be allotted to it. The AIADMK Tuesday sealed the electoral pacts with the BJP and PMK allotting them seven and five Lok Sabha seats respectively while indicating more parties might join the front. After the conclusion of seat sharing with allies, the DMK will contest in rest of the constituencies, he said. "We did not hold talks secretly in a hotel, but it was conducted in a transparent manner at our party headquarters here," he said taking a dig at AIADMK which concluded talks with allies in a star hotel here. To a question on the AIADMK-led alliance describing itself as "people's welfare coalition," he alleged that "people call it as an alliance for money." The DMK-Congress pact came after conclusion of final round of talks Wednesday preceded by parleys between the top leadership of the two parties. DMK Rajya Sabha MP Kanimozhi held talks with Congress president Rahul Gandhi days ago in Delhi on seat sharing. "It was decided during talks between the leadership of both the parties to allot nine seats in Tamil Nadu and one in Pudhcherry to Congress," Stalin told reporters here. Asked if the alliance will cover the bypolls expected to the 21 assembly seats as well, he said "let the byelections be announced in the first place." At the talks Wednesday, the Congress side was represented by Wasnik, Venugopal and legislature party leader K R Ramasamy. Besides Stalin, DMK treasurer Duraimurugan and principal secretary T R Baalu were also present. After the DMK quit the UPA in 2013, the Congress had to face the 2014 Lok Sabha polls alone in Tamil Nadu. DMK, which had faced the polls in alliance with smaller outfits, drew a blank despite contesting 35 seats. Congress had lost deposits in 38 constituencies. In 2009, the Congress had won eight seats in alliance with DMK after contesting 16 seats.